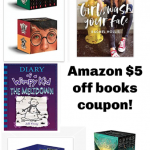 Amazon $5 off $20 books coupon! You are here: Home / online shopping / Amazon $5 off $20 books coupon! This post contains affiliate links. Please refer to my disclosure policy for more information. 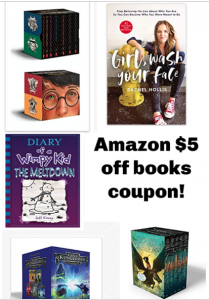 If something to read is part of your Christmas tradition, make sure you take advantage of this Amazon $5 off $20 books coupon!! It ends TONIGHT! If you haven’t read Wonder yet, it’s a great book for the entire family!! You can also grab the sequel, Auggie & Me and The Meltdown (the newest Diary of a Wimpy Kid book) for just $18.35 after the coupon code! I’ve heard so many things about Rachel Hollis’ new book – Girl, Wash Your Face and you can get that plus The Magnolia Story by Chip and Joanna Gaines for just $21.91. The Michael Vey boxed set is $25.11 after coupon. Do your kids watch A Series of Unfortunate Events on Netflix? The show was inspired by the books by Lemony Snicket! Now you can get the Series of Unfortunate Events boxed set for $19.53 after coupon. The Five Kingdom series is another popular series for tweens. Get the boxed set for $45.97 after coupon. The Underland Chronicles was written by Suzanne Collins (author of The Hunger Games series). Get the entire boxed set for just $19.82 after coupon. 39 Clues is a popular series written by Rick Riordan, author of the Percy Jackson series. You can get all 11 books for just $41.99 with the $5 off code! The Ranger’s Apprentice boxed set is just $15.49 with the code! Get the Fablehaven series for $20.49 with the code! AND…if your kids haven’t read the Harry Potter series yet, it’s a great time to grab it!! There’s a $13 off coupon on the product page PLUS the $5 off coupon. Get the set for $40.50! WHOA! This is a throwback to my childhood! Get The Baby-Sitters Club Retro Tin and book set for just $21.13 after the clippable coupon on the page and the $5 off code. This brings back SO many memories for me. My friends and I actually started our own Babysitter’s Club! Need more ideas? Here’s what my kids are reading right now! Jennifer Nielsen did an author visit at my son’s junior high. He read Resistance first and is now reading A Night Divided and has loved them both. He has dyslexia and is a “reluctant reader” so I love seeing him so excited about reading! He’s 11. You can get both of these books for $15.08 with the discount codes. My daughter is an animal lover. She loved the movie A Dog’s Purpose and is now making her way through all of the Bruce Cameron books. You can get A Dog’s Purpose Boxed Set plus The Dogs of Christmas, which is also by Bruce Cameron for $19.59! Grab the A Dog’s Purpose DVD, too! It’s only $4! What did you use your $5 off coupon for? Crest 3D Whitestrips just $19.78 shipped! Mega Bloks 90 piece bag just $10.99! 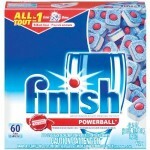 Finish Powerball Tablets (60 ct) just $11.30 shipped! 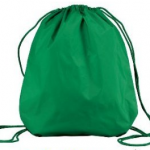 Port Authority Drawstring Backpacks just $4.54 shipped! Earn more Swagbucks with Swag IQ! Earn Cash Back on your Christmas Shopping! Sharpie Fine Point Markers Sale! Coupon resources by Melissa White is licensed under a Creative Commons Attribution-Noncommercial-No Derivative Works 3.0 United States License.